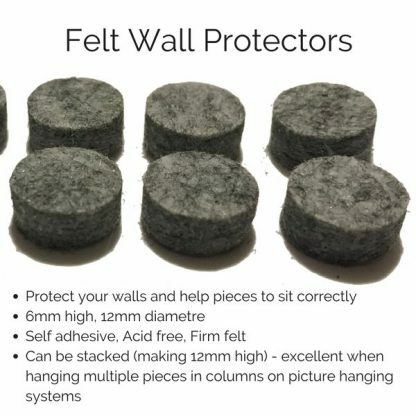 These Felt Wall Protectors by ‘HangRight’ have been specially produced to assist users of picture hanging systems to achieve the best hanging results. Sold in packs of 200 dots, enough for 100 pieces in the standard application or 50 pieces when double height dots are required. These high quality wall protectors consist of a firm felt with an adhesive backing and are acid free. 12mm diameter and 6mm high they are perfect for everyday applications or can be doubled up to create a 12mm high wall protector which can be very useful when you need to push the bottom of the suspended piece out from the wall slightly; often useful when hanging more than once piece on the same dropper.